The Cloud-based smartphone began life as a Kickstarter project and has collected $1.36 million USD thus far. 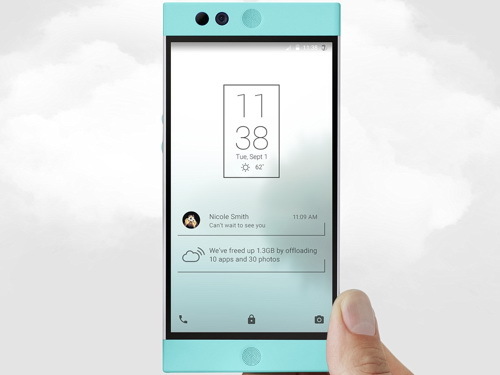 At first glance, the Nextbit Robin may appear like an ordinary high-end smartphone with its 5.2-inch FHD display, Snapdragon 808 SoC, 3 GB RAM, 32 GB eMMC, 13 MP + 5 MP cameras, fingerprint sensor, NFC, Quick Charge, stereo speakers, and a 2580 mAh battery. The defining feature, however, is its special Cloud-based services. The Nextbit Robin allows users to quickly move installed apps and files to a server through the Internet. It's not unlike Google Drive, but the Robin is tailored heavily towards easy transfers between local and Cloud-based files. The Nextbit Robin can now be ordered via its official online store at bakerkit.com for a price of just under $400 USD. Shipping costs vary considerably between regions. Users in Germany, for example, must pay $95 USD for shipping compared to just $25 for U.S. buyers. The Kickstarter is aiming for a ship date of January 2016 for early backers of the project. Colors are available in Gray and Teal and will launch for all major U.S. carriers including GSM and CDMA networks. The latter is a bit of a surprise as a good chunk of International smartphones tend to skip CDMA compatibility altogether.